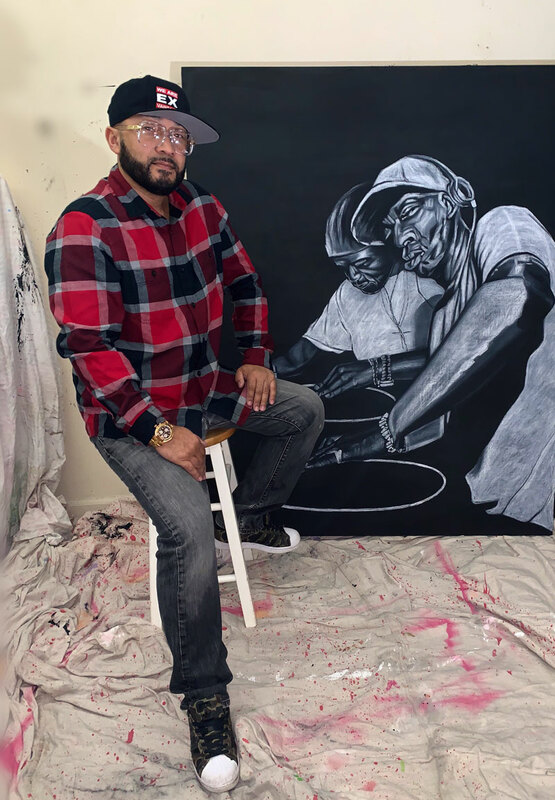 Curated by impresario Anthony Bowman, the exhibit pays homage to the early days of Hip Hop, its pioneers, and its progenitors. Icons such as James Brown(s), George Clinton, Grand Master Flash, and Crazy Legs are represented in a starkly naturalistic style in white and black. Power paints the early history of Hip Hop in a nostalgic way, without sugar-coating it. His raw depiction of these pillars of the Hip Hop community, and use of symbols that define the era in mention transport the audience back in time, providing the feelings of belonging and understanding. He is able to depict the simple power and creativity of a groundbreaking art form at its inception with solely the use of these images. Regardless of who you are, these works evoke the spirit of the beginning of Hip Hop and serves as a reminder that the home and birthplace of Hip Hop is the streets of New York City. Power subverts the classical norm of a black image on a white background by working in white charcoal on a painted black background. Charcoal is one of the oldest methods of mark-making and has been in use since before written histories. Power’s grisaille technique is photo-based but he is not a photorealist. His use of white on black is emotive, energized, and evocative of the persona of its subjects. Will Power is a painter, muralist and Graffiti writer from Jersey City, New Jersey. Coming of age in the late 1980’s he experienced the evolution of Hip-Hop first hand, reveling in its attitude of free expression. His work can be described as Retro Renaissance, which is heavily noted in this exhibit. This exhibition is testament to his passion and the pride of those represented in the art.